Now, I have a problem with any "Metro" system that names its lines "East London Railway" or "West London Line" etc. Why? To me it conjures up fat controllers and steam engines, complicated timetables and no Sunday service. Now, that's fine for a system with no pretensions beyond being a suburban rail service. But TFL clearly do have big ambitions for the Underground's little sister. It's on the Tube map, its being extended, its being homogenised, it's getting new trains and an orange roundel of its own. It almost looks like an S-Bahn. Except for one thing. The East London Railway doesn't sound like it's going to get me anywhere fast. Looking on the map, all the lines are a similar double-stripe orange, and it's not clear where services are running from and to. What would convince me? Well, a branding and diagrammatic scheme in line with London Underground. Now, I don't much care if it's a double line to distinguish it from Underground lines. That's fine. Or if they use pastel colours or dashed lines. Don't care at all. What is important is that the colour should be distinct and that the lines should be distinctly numbered. I'm far more inclined to hop on Overground Line 3 Westbound, than attempt to make the o8.53 stopping service to Gospel Oak on the "Gospel Oak to Barking traction Railway (steam trains to all parts of the metropolis)", especially if it had a neat light blue, or lilac colour. Then I could swiftly change onto Line 1 Eastbound (the green one), and continue my journey to Highbury & Islington confidently knowing I won't be waiting more than 8 minutes on the platform. I need something to sweep away the images of rattling points and clouds of steam. My general rule of thumb; how easily could you explain it to a foreigner? Make any sense to anyone? I agree in general, but disagree with the exclusion of the West/North London Lines & East London Railway names. London is such a rich historic city and it's great evocative station names (Shoreditch, Kentish Town, Moorgate, Rotherhithe, Mudchute for example) as well as line names (Bakerloo, Hammersmith & City). 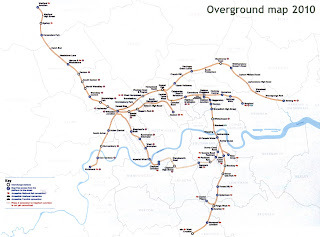 The North London, West London, East London, and abuilding South London Line segments of the Overground are great historic names AND very descriptive of their routing. The last line, GOBLIN, is a wonderful contraction of the line's terminii, much in the fashin of Baker Street & Waterloo Ry became the Bakerloo. However I concede that the DC Lines doesn't mean anything to anyone except trainspotters.